We look at the short and long-term priorities. Aid agencies will begin to distribute staple foods such as rice, beans, vegetable oil and salt - instead of just emergency ration packs - once cooking equipment has been distributed widely and safe water supplies have been established. The main challenges are post-operative care and logistical support to the health facilities in terms of fuel and medical supplies, according to the UN humanitarian agency OCHA. Haiti's ministry of health and the World Health Organization (WHO) is revising its emergency response strategy and will gradually shift the focus from emergency surgical cases to primary health care. "Priorities are changing, and there is more need for post-operative care and follow-up. But there is still little capacity to help patients who need that follow-up care," WHO Director Dr Mirta Roses said on 25 January. 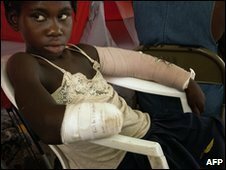 Among the most urgent needs are those of thousands of Haitians who had amputations as a result of injuries. "These people will need physical rehabilitation as well as mental health services. That means more nursing and mental health personnel and more physical therapists, and of course the right equipment for these kinds of programmes," said Dr Roses. Doctors fear many amputees will languish or even die without proper rehabilitation. As the emergency phase of the disaster winds down, there is a pressing need for mobile and community-based clinics that can provide such services as maternity care, post-operative care, and treatment for chronic health problems including diabetes, heart disease, HIV, and tuberculosis, the WHO says. Forty-three of the 59 hospitals, are now functioning, but they are having difficulty meeting the demand for health services, especially as the emergency medical personnel who arrived after the earthquake head home. Also important is establishing surveillance networks to detect outbreaks of communicable diseases, a significant threat at the makeshift camps. The International Organisation for Migration (IOM) says work is under way to improve the living conditions of the estimated 692,000 people in makeshift shelters in 591 camps in Port-au-Prince, until more durable solutions are found. More than 235,000 people have taken advantage of the Haitian government's offer of free transportation to cities in the north and south-west. 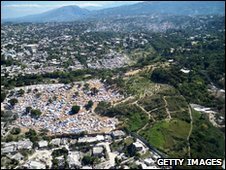 Although the IOM had 10,000 tents stored in Haiti before the earthquake and has a further 30,000 abroad that will arrive soon, it says "the supply is unlikely to address the extensive shelter needs". The UN agency estimates that 100,000 family-sized tents are needed to house about 500,000 people, but the UN says up to one million require shelter. 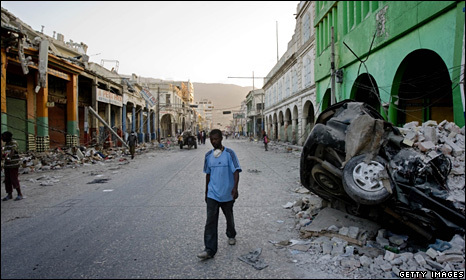 Haiti is likely to need billions of dollars to build new homes and government buildings in Port-au-Prince and the surrounding area, which were densely-populated before the earthquake. Many of the buildings that collapsed were poorly designed and built - mostly with concrete and often without steel reinforcement and foundations. There is a clear need for higher technical standards to be used during reconstruction. But Haiti's government, along with many planning and architectural experts, have also called for a new strategy that will help Haiti build for the future, including reducing Port-au-Prince's population density and replacing slums on unstable hillsides with homes that are safe, affordable and sustainable. A new comprehensive building code that complies with international construction standards will be a priority. Cletus Springer, the director of sustainable development at the Organisation of American States, said that for this to happen the authorities would have to work with the private sector and banks to help low-income families. "Because of the poverty levels, not everybody's going to be able to build to the exacting standards that a building code would require," he said. In the short-term, the United Nations Human Settlements Programme (UN-Habitat) is carrying out a rapid structural damage estimate of buildings in the affected area. Jean Yves Barcelo, the agency's adviser in Haiti, hopes it will start planning for new settlements and at the neighbourhood level within a week or two. 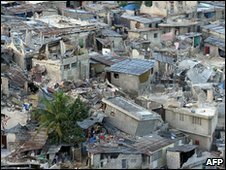 Experts warn that desperate residents of the poorer areas of Port-au-Prince may begin informal and unregulated reconstruction before a long-term reconstruction plan can be instigated. The lack of investment in Haiti's rural economy over the past three decades has led to an average of 75,000 people moving to the capital, Port-au-Prince, every year. Since 1982, the city's population has grown from 750,000 to more than 2.5 million. The rapid expansion was not planned and resulted in overcrowding, inadequate infrastructure, and the proliferation of slums containing scores of poorly-built homes, many of which were destroyed by the earthquake. Key official buildings - the presidential palace, parliament building, police headquarters and 13 of the government's 15 ministries - were also destroyed. Many experts say that Port-au-Prince should be reduced in size when rebuilt, and Haiti's economic and government activities decentralised. Some have even suggested relocating the capital altogether. 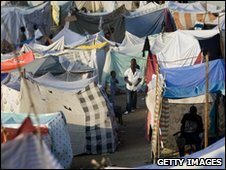 Hundreds of thousands of people have already left the city for tented settlements or family homes in other parts of Haiti. Many say they should be persuaded to stay. Experts warn, however, that mass-relocation schemes after other disasters have usually failed because they isolate people from the jobs and economic opportunity that drew them to the city in the first place. While the main airport in Port-au-Prince was not put out of action by the disaster, it was not equipped to deal with the volume of flights required by the relief effort. To speed up the process, the US military took over control of the airport and 160 planes a day are currently able to land. Aid flights are also coming into and out of the Dominican Republic and several other regional airports in Haiti. 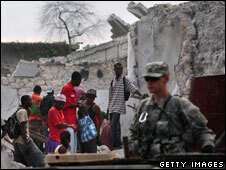 Port-au-Prince's main port was also badly damaged and other ports in the area could only accept smaller vessels. One of the two piers in the capital's docks was recently reopened by the US Navy, allowing bulkier shipments to be delivered by sea. At present, 150 containers can be unloaded a day. The transportation of aid by road continues to be hampered by piles of rubble and the volume of people trying to move out of or around the capital. But the UN Development Programme (UNDP) has begun employing local people to clear roads. Telephones and internet connections were down in many areas of Haiti for some time. The situation has since improved, with emergency radios distributed and limited internet and phone capacity restored. Experts say large-scale capital investment, led by the World Bank and the Inter-American Development Bank, will be needed to bring the road, electricity, water and telephone systems up to standard, and rebuild Port-au-Prince's seaport and airport. There has been concern about the security situation in Haiti, with fears that people not receiving aid would turn to violence. 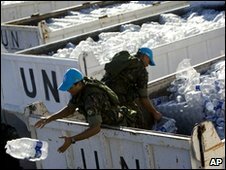 In a bid to boost security and assist the relief effort, the UN Security Council is increasing the UN stabilisation mission in Haiti (MINUSTAH) by 3,500 troops to 12,651. Brazil plans to double its current contingent of 1,300. The EU is also deploying 150 officers of its new European Gendarmerie Force to assist the 3,500-strong UN police force, UNPOL, and the Haitian Police Force (HNP), which has, so far, managed to get half of its 8,000 officers back on the streets. 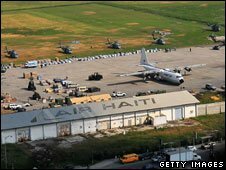 Meanwhile, the US has dispatched more than 15,000 military personnel to Haiti. About 4,700 are deployed on the ground with the rest on ships off the coast. The UN and US military have also set up a Joint Operations Tasking Centre to co-ordinate security in and around Port-au-Prince. The US ambassador to Haiti, Ken Merten, says the rebuilding efforts have to focus on creating jobs and attracting investment to Haiti. Without it, those displaced will need income support or food aid to survive for the foreseeable future. The UN Development Programme has said that as part of the rebuilding strategy, it aims to temporarily employ 220,000 Haitians to work clearing debris and restoring basic infrastructure. A long-term economic strategy prepared by the UN in 2009 that remains valid aimed to create 150,000 jobs over two years by harnessing Haiti's advantages in clothing manufacturing, tourism and agriculture. International investors had launched a number of big projects before the earthquake and will be encouraged to stay. Economists Paul Collier and Jean-Louis Warnholz, both of whom have experience in Haiti, say there is a need to relocate economic activity away from Port-au-Prince. They propose that the construction of new homes be linked to the generation of new economic opportunities, in areas less prone to natural disasters. This would require the expansion of secondary cities and agricultural modernisation. "Done right, international intervention can deliver immediate jobs through construction, and longer-term jobs through new enterprises. Done wrong, it will only pour relief into Port-au-Prince, luring in rural migrants from the impoverished central plateau, and further diminishing local food production at a time when it is most needed," they wrote in the Financial Times. To guarantee effective management of the funding in a country where the government was overwhelmed before the earthquake, economists have proposed pooling money into a single "Haiti Fund" that can be used for development. "It should receive emergency outlays from the United States and other donors; organise a board that includes members appointed by Haitian President Rene Preval, the UN secretary general and donors; and empower a management team to formulate and execute plans agreed to by the Haitian government," wrote Jeffrey Sachs, a leading development economist, in the Washington Post. Mr Sachs estimates that annual donations of $2bn to $3bn will be required over the next five years to cover urgent reconstruction costs and development financing. The head of the International Monetary Fund, Dominique Strauss-Khan, has even gone so far as to call for a new "Marshall Plan", which helped rebuild Europe after World War II, and warned against "a piecemeal approach" in Haiti. One of the first steps in the transition from emergency relief into reconstruction and development is food security, and the UN Food and Agriculture Organisation (FAO) has warned that it is crucial that any damage to agricultural infrastructure must be repaired as soon as possible. FAO Director-General Jacques Diouf says famers must be given immediate support before the spring planting season begins in March. The season, which lasts until May, accounts for 60% of Haiti's national agricultural production. Over the past 20 years Haiti has become dependent on food imports, yet around 80% of the population are involved in agriculture. In the long term, officials hope to develop a rural agricultural strategy that would enable Haiti to become more self-sufficient. At the recent donor conference in Montreal, the US and other nations made it clear that Haiti's government had to lead the reconstruction effort. The international community also reiterated its support for Haiti's President, Rene Preval, and its Prime Minister, Jean-Max Bellerive. Mr Preval, who was elected in 2006 with broad popular support, initiated reforms of the police and judiciary with some success, according to Mark Schneider of the International Crisis Group. His government was also able to forge a national consensus on a recovery plan following the devastating hurricanes of 2008. Nevertheless, the destruction of its ministries and deaths of hundreds of civil servants has meant the government has struggled to take control of the relief effort. Survivors are growing increasingly frustrated by its perceived inaction.